Actually, that's not true. I found it in the compost bin. The compost bin that's been overrun with a ginormous volunteer vine since this spring. We've been wondering what might make an appearance. Crazy zucchini? Pumpkins? After hundreds of blossoms, we didn't see any sign of fruit. But then, as I was harvesting tomatoes today, something caught my eye. Something orange. And round. I've planted pumpkins in the past--planned them, pampered them...with no success. Squash vine borers always melted the vines before a pumpkin appeared. 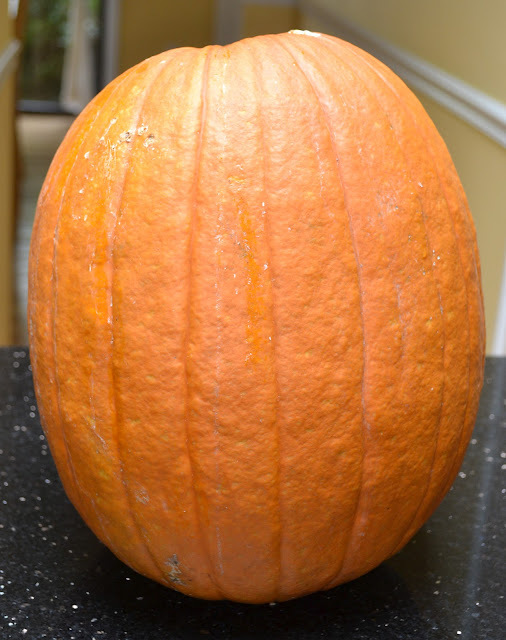 The year I forgo pumpkins, we have a perfect one--in July. Gardening is a mystery. An ironic, often frustrating, sometimes perfectly fun mystery. Sadly, in my excitement to get the pumpkin out of the compost bin to show the kids--I broke the stem. Still, stay tuned...I do believe a jack-o-lantern will make an appearance on our doorstep tonight.